Lined dress, floor-length has close-fitting, boned self fabric or contrast bodice with front princess seams, raised waist, skirt front drape, flared skirt with self fabric or contrast godet, back button and loop closing. 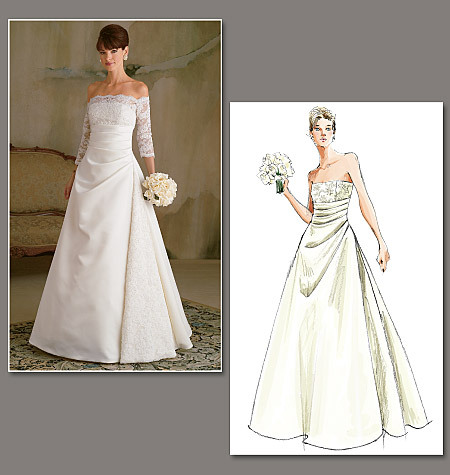 A: contrast overbodice and below-elbow sleeves. 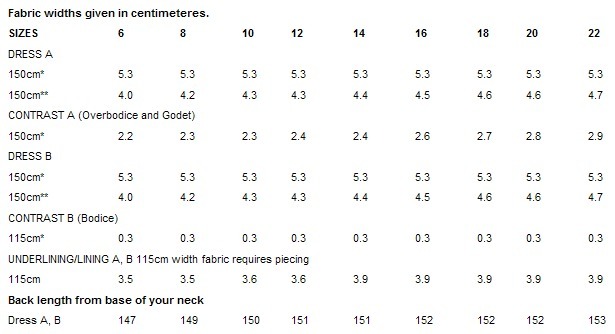 Notions description...NOTIONS: Dress A, B: 3/4 yd. of 1/4" Covered Boning, 1 yd. of Bridal Loops, Approximately Forty 3/8" Covered Buttons and 3/4 yd. of 1/4" Elastic.